AMD announced the world’s first 1GHz graphics processor (without third-party / overclocking) with the ATI Radeon HD 4890 GPU with air cooling. When HD 4890 is released it is the 850MHz clock version. Power color released 950MHz core clock speed version. What ever we are seeing the 1GHz versions are overclocked verions of Standard 850MHz core clock speed. 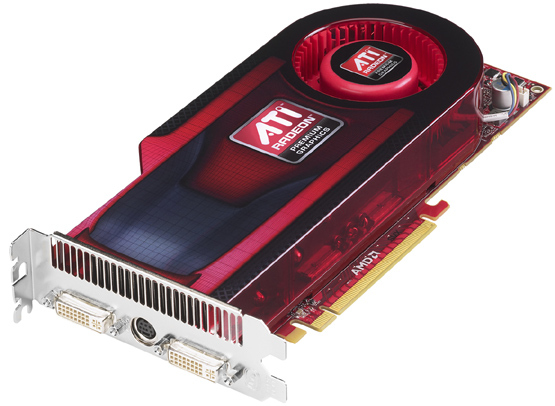 The ATI Radeon HD 4890, boasts a whopping 1.36 TeraFLOPs of compute power, superior GDDR5 memory. The ATI Radeon HD 4890 comes with DirectX 10.1 support. With this product, AMD achieves a notable engineering milestone as the first graphics company to break the 1 GHz barrier. The new ATI Radeon HD 4890 utilizes advanced GDDR5 memory and a 1 GHz clock speed to deliver 1.6 TeraFLOPs of compute power, 50 percent more than that of the competition best single-GPU solution2. With this level of raw compute power, the1 GHz ATI Radeon HD 4890 is set to deliver new levels of general purpose GPU-accelerated performance in ATI Stream applications such as video transcoding and post processing. This new version of the ATI Radeon HD 4890 marks the latest addition to the award-winning ATI Radeon HD 4000 series delivered by AMD technology partners Sapphire, XFX, Asus and TUL. The advanced design of the ATI Radeon HD 4890 delivers an amazing gaming experience in the latest games, including ground-breaking DirectX 10.1 titles such as Ubisoft Tom Clancy’s H.A.W.X., Electronic Arts BattleForge and SEGA’s Stormrise released last month, as well as GSC Gameworld’s S.T.A.L.K.E.R: Clear Sky. When compared to DirectX 10 game play, DirectX 10.1 games have proven to deliver higher game performance and an improved visual experience. In addition, these cards feature support for open standards like OpenGL3 with DirectX 10-like hardware extensions, and the recently ratified OpenCL specification. The ATI Radeon HD 4890 supports advanced game physics. At the 2009 Game Developers Conference in San Francisco, Havok and AMD demonstrated the first implementation of OpenCL running on AMD graphics processors. In the demonstration, Havoks physics technology delivered complex and realistic simulations of real-world materials like cloth, demonstrating the potential for increased realism in forthcoming games. To date, the ATI Radeon HD 4890 card has won numerous awards, including the prestigious Editor Choice Gold Award from HardOCP, the HotHardware Recommended Award and the Editor Choice Award from Tweaktown, among others. The accolades speak to the excitement around the product and to the continued strength of the discrete graphics market overall, something analyst Dr. Jon Peddie of Jon Peddie Research predicts will continue to play a strong role in the computing industry. As a result of the worldwide accolades from media, developers, enthusiasts and fans, AMD released an inside look at how the card was made and what it means for gamers. The card marks a new aspect to the AMD Dragon desktop platform technology, providing an even more powerful single GPU desktop graphics option to OEMs, channel partners, and do-it-yourself (DIY) consumers.